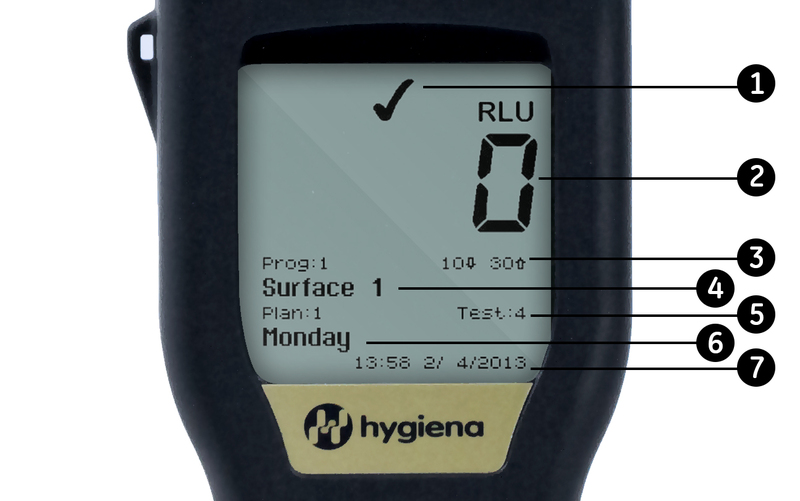 Quickly verify sanitation efficacy with Hygiena's EnSURE quality monitoring system. ATP testing is used around the globe and is a recognized tool by auditors for validating cleaning processes and complies with government and HACCP regulations. Hygiena's line of affordable surface and liquid ATP testing devices is ideal for any food or beverage processor. 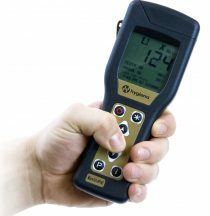 These tests provide rapid and easy verification of equipment cleanliness and safety. Regular ATP sanitation monitoring helps prevent biofilm build-up and product spoilage to ensure manufacturing quality of the highest standard. The EnSURE monitoring system is designed to be used for multiple quality and food safety tests. Hygiena provides rapid ATP tests and 8-hour microorganism tests for products and environmental surfaces. Everything you need on one screen. 1. Pass/Caution/Fail result symbol - a quick and easy way to interpret test results. 2. RLU result (0-9,999) - big and bold so it's easy to see the result. 3. Pass and fail limits for the location - helps you see how close the result is to the pass and fail limits. 4. Location name and number (up to 5,000) - easily access specific locations and record results to that location. 5. Test counter (up to 2,000) - shows you how many tests have been measured since the last sync. 6. Test plan name and number (up to 100) - assign specific locations to test plans to easily access test points. 7. Time Stamp - records the time and date with every test. 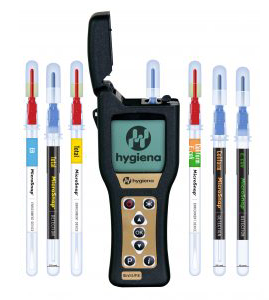 A user-friendly, all-in-one ATP sampling test used with Hygiena luminometers. This pen-sized sample collection device is easy to use, small, and environmentally friendly. In addition, UltraSnap uses a unique liquid-stable reagent providing superior accuracy, longer-lasting signal strength, and more reproducible results. The most sensitive ATP surface test in Hygiena’s portfolio of all-in-one devices..SuperSnap detects extremely low levels of ATP so it can be used as an allergen cross-contamination prevention tool or when dealing with harsh samples. By incorporating SuperSnap into a prevention program, risks and issues are recognized in real time and immediate corrective actions can be implemented before product change-overs. MicroSnap™ Coliform is a rapid test for detection and enumeration of Coliform bacteria. The test uses a novel bioluminogenic test reaction that generates light when enzymes that are characteristic of Coliform bacteria react with specialized substrates to produce light. The light generating signal is then quantified in the EnSURE™ luminometer. Depending on the required level of detection, MicroSnap Coliform is able to give results in the same day. MicroSnap™ Total delivers same-day TVC test results, giving you the advantage of knowing microbial levels on the same day samples are collected. The test uses a novel bioluminogenic test reaction that generates light when enzymes that are characteristic of viable bacteria react with substrates to produce light. The light generating signal is then quantified with the EnSURE™ luminometer. MicroSnap Total’s same-day results enable you to take corrective actions faster or release products sooner. (AOAC-RI Performance Tested Method #031501). AquaSnap™ Total measures both free ATP in solution and microbial ATP. The device contains a detergent to release ATP that is bound to microbial or organic matter and inside microbes. AquaSnap is easy to use, economical, and gives real time results. The specifically designed dipper tip collects 100 µl of water ensuring consistent sample collection. 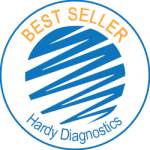 Get up and running with a cost effective and rapid testing system to verify the efficacy of your cleaning protocol. d.	Use the shipping label provided for the EQUIPMENT return. If there is no shipping label, please contact COMPANY so that COMPANY may forward one.